Trustees of the Citizens for Justice and Peace (CJP), fighting a crucial battle against Gujarat chief minister Narendra Modi’s alleged complicity in 2002 riots, have condemned what they call “malicious lies" being spread by the Gujarat government in "misleading" courts of law about the CJP ‘cheating’ victims of the riots. The statement is in response to the Gujarat police, which told the Bombay high court, opposing the petition filed by social activist Teesta Setalvad and her husband seeking quashing of an FIR against them for alleged misappropriation of funds, that the duo had indeed cheated victims of 2002 Godhra riots and "embezzled funds" in their name. Prosecution probing "embezzlement" Ajay Choksi simultaneously told the sessions court in Ahmedabad that Setalvad should be "quizzed" in custody to set an example (click HERE). Signed by IM Kadri, Nandan Maluste, Teesta Setalvad, Cyrus Guzder, Javed Akhtar, Alyque Padamsee, Anil Dharker, Ghulam Pesh Imam, Javed Anand, Rahul Bose and Father Cedric Prakash, the statement has said the nexus at work against Setelvad consists of “Gujarat government headed by Modi, its crime branch headed by powerful policemen who have been collaborators of the regime since 2002, and Rais Khan Pathan, a former employee of the CJP, who is being used as a proxy in this malicious war”. “Tanvir Jafri, son of Zakia Jafri and the late Ahsan Jafri has also been made a co-accused in the criminal complaint, which a further sign of rank intimidation”, the statement says, wondering, why was the Gujarat government afraid of the higher courts. The crime branch has concealed the fact that while Rais Khan, a disgruntled ex-employee of CJP, till December 2007, was paid a total salary of Rs. 9,63,500, was provided free housing and a vehicle. Setalvad (who functioned as chief executive) neither asked for, nor received a single rupee as salary from the organisation between April 2002 (when CJP was founded and December 2009 (nearly eight years). Nor is there any mention of the fact that unlike Rais Khan, she neither asked for nor received any accommodation allowance. The crime branch has aggregated all the donations and grants received by CJP and Sabrang Trust and claimed that the entire amount was collected for the sole purpose of proposed Gulberg Memorial. The fact is, while Sabrang Trust has in total received approximately Rs 4.5 lakh only earmarked by donors for the memorial, CJP did not receive a single rupee for the same. It is total falsehood that around Rs 2.62 crore was collected by Sabrang Trust between April 10, 2007 and February 20, 2014 for the museum. A table contained in Setalvad’s affidavit where the purpose for which the foreign contributions were strictly to be used were clearly specified by the donors is clearly spelt out. It is evident that only around Rs 4.5 lakh in all was earmarked by the donors for the Gulberg Memorial. It is also evident from the table that the total foreign contributions received by Sabrang Trust totaled around Rs 1.33 crore and not Rs 2.62, as claimed by the crime branch. The highly exaggerated figure is the result of a simple accounting subterfuge: Of the total of Rs 1.33 crore received over the relevant period, a total of Rs 1.21 crore were transferred from the trust’s savings a/c to term deposits in the same bank with a view to earning extra interest income for the trust. On maturity the same deposits along with interest totaling around Rs 1.26 crore were credited back into the savings account. 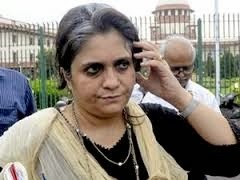 It has been alleged that Setalvad got over Rs 21.6 lakh from Sabrang Trust between October 1, 2009 and June 30, 2013. Similarly, it has been alleged that Javed Anand received over Rs 20 lakh from Sabrang Trust during the same period. They were not paid this or even part of this amount in their capacity as trustees of Sabrang Trust. They were paid these amounts (averaging to Rs. 48,000 per month in case of Setalvad and around 47,700 per month in case of Javed Anand) for discharging their duties as project director and project administrator. It has been alleged that over a six year period (between April 12, 2007 and June 4, 2013 a total of only Rs 2,49,000 was spent on legal aid from the non-FCRA account of CJP. This is purely a figment of the crime branch’s twisted imagination. A detailed year-by-year account provided by Setalvad shows that CJP spent a total of over Rs 2 crore (100 times the crime branch’s figure) on legal aid.